Another movie that my wife and I saw together (Oh my God! He never writes movie reviews!). Unlike Cinderella this movie had the level of passion I’ve come to expect from romance movies. The Longest Ride is another Nicholas Sparks book turned to a movie. It seems like he and Stephen King get every single one of their books optioned into a movie script. If you’ve seen The Notebook this is more of what that movie offered. It even has a story within a story like The Notebook. 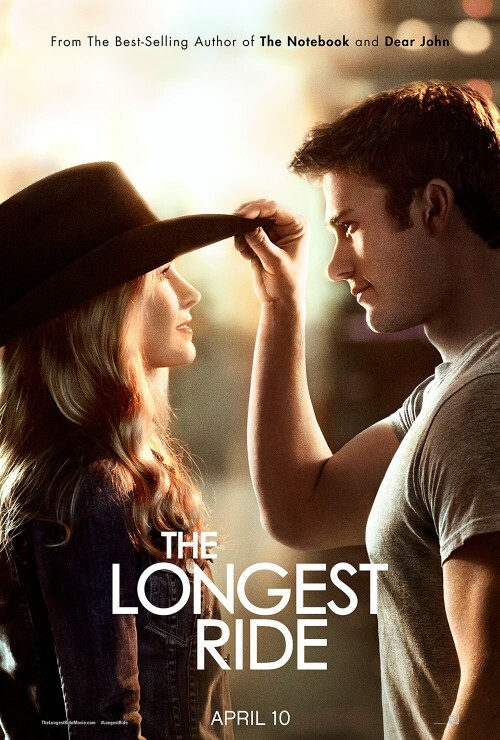 The Longest Ride starts by establishing a budding relationship between Sophia, aspiring art student, and Luke, professional bull rider. On the way home from their first date at a secluded lake Luke and Sophia spot a crashed car off the side of the road. They pull an old man from the wreckage. He’s a bit out of it, but he has enough sense to ask them to save a box from the backseat of the car. They rush him to the hospital. Somewhere in there Sophia tells Luke that she’s moving to New York for an art internship in two months and she’s not sure she wants a serious relationship. They get the man to the hospital and Luke leaves. Sophia stays and opens the box to find dozens of letters written by the rescued man, Ira, to his wife, Ruth. When Ira awakes, Sophia tells him she read one of the letters and he asks her to read the rest to him as his eyesight no longer allows him to read them to himself (Ruth is dead and can’t read them to him either). From there the movie tells two parallel storylines of the romance between Ira and Ruth and the romance between Luke and Sophia. Luke and Sophia have the drama of Sophia’s plan to move to New York, Luke’s persistence in bull riding even after a serious injury, and the culture clash between their two worlds. Ira and Ruth are two Jews that escaped Nazi Europe and fall in love in the USA. Ira joins the army to fight the Nazis and sustains an injury that sterilizes him. The main conflict in that story is Ira’s inability to have children and Ruth’s desire to fill that void anyway she can. Both the stories are fun in their own way and while one segment is going on I started to develop a thirst to find out what was happening in the other segment. If you’ve seen one Nicholas Sparks movie you’ve seen them all. You probably already know exactly what’s going to happen in this movie. My wife and I happen to like Nicholas Sparks movies, so I’d definitely recommend this to anyone else who enjoyed other adaptions of his work.